Officials from West Virginia Northern Community College and Ohio Valley Medical Center Monday signed a strengthened agreement in a unique initiative that grants college credit as part of a hospital-based radiology program. The partnership allows for awarding of an Associate in Applied Science degree in the Radiologic Technology Degree Completion program at WVNCC. Dr. Vicki Riley, Northern’s vice president of academic affairs, explained students who successfully complete the OVMC certification program and complete Northern’s college coursework then are awarded the AAS degree and become eligible to sit for the National Registry Examination. “This articulation agreement provides a degree option to students wishing to enter this field where jobs are in high demand,” Riley said. She pointed out the U.S. Department of Labor, Bureau of Statistics, indicates that employment for radiologic technologists is expected to grow faster than average through the year 2016. Radiologic technologists use various kinds of imaging techniques for diagnostic and therapeutic procedures. Use of ultrasound, computerized tomography and magnetic resonance imaging are common procedures such technologists employ. 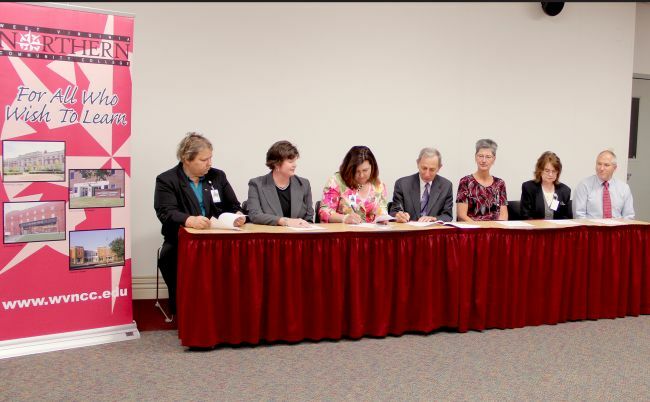 Attending the signing ceremony, conducted in the auditorium of the B&O Building on the downtown Wheeling campus, from WVNCC were Olshinsky, Riley, Misty Kahl, radiography program director and assistant professor; and Ralph Lucki, health sciences division chair. Attending from OVMC were Laurie Labishak, vice president of marketing; Judy Duvall, manager of radiology, and Catherine Ball, program director. Along with the Radiologic Technology Degree Completion program, WVNCC also offers a full program that leads to the awarding of an AAS degree in radiography.